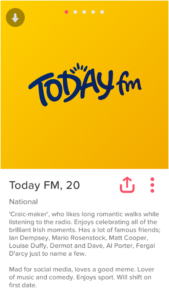 We’re delighted to be the NO.1 station for 25-44 year olds in Ireland. Every day we’re lucky to connect with a bunch of sounders on air and online to share hilarious and heartwarming stories, breaking news and of course...all of the tunes you love listening to! So where can you find us? Firstly, we’re in your radio (not physically!) between frequencies 100 and 102 FM around Ireland. Or you can download our lovely new app here if you're an iPhone user and here if you're an android user. We can also be found on Virgin Media channel 904, TuneIn AND on the Irish Radio Player App.